Public transport operators and authorities in Paris have become the first people in Europe to see the world’s first pure electric coach. Developed by BYD, the coach could transform the city vehicle market which impacts on air quality. The BYD coach, developed using the experience of BYD’s world leading position in the pure electric bus market, is currently under homologation testing prior to its introduction in Europe. Paris was chosen for the preview appearance thanks to a drive by the city’s mayor to reduce pollution from such vehicles. With a range of 200km under typical operating conditions and a recharge time of only 2.5 hours, the all new BYD coach could complete many coaching applications in and around cities – such as shuttle services, city sightseeing, hotel and airport feeder services. At the event in Paris, BYD’s Founder and Chairman Wang Chuanfu said: “Just a few months ago my colleagues and I were here to participate in the COP21 UN climate change negotiations and we were impressed by the determination of the authorities not only in Paris but across France to do more to improve the quality of the air their citizens breathe. We heard an impassioned plea by the Mayor of Paris, Anne Hidalgo, to assist in greening one of the world’s most beautiful cities. Not only does she, as representative of the municipality, together with STIF, plan to ensure that all of the 4,500 city buses are zero or low emission by 2025 but they specifically referred to diesel-engined coaches as being a major source of pollution. This was a prophetic pronouncement – other cities have yet to target this particular class of vehicle, but of course they will in the future”. Isbrand Ho, Managing Director of BYD Europe, added: “We’ll shortly be announcing our introduction plans for our coach in Europe, with France as our first market. Many of the technologies we have developed about our city bus range – also with experience of millions of kilometres of in service running - are applicable to this new model: the BYD pure electric coach. We are confident we have a vehicle which exactly suits the city’s needs”. 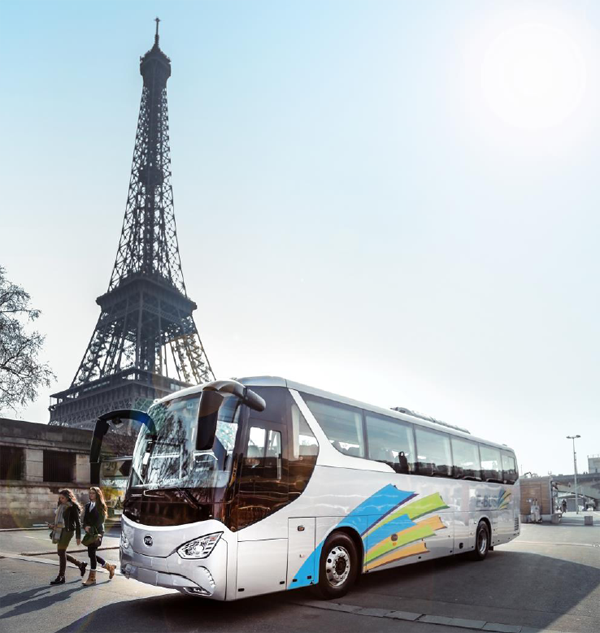 Mr. Ho revealed details of a new BYD sales team in France joined by Bertrand Berger, who has extensive experience in the French bus and coach world. BYD Company Ltd. is one of China’s largest companies and has successfully expanded globally. Specializing in battery technologies, their green mission to “solve the whole problem” has made them industry pioneers and leaders in several High-tech sectors including High-efficiency Automobiles, Electrified Public Transportation, Environmentally-Friendly Energy Storage, Affordable Solar Power and Information Technology and Original Design Manufacturing (ODM) services. As the world’s largest manufacturer of rechargeable batteries, their mission to create safer and more environmentally friendly battery technologies has led to the development of the BYD Iron Phosphate (or "Fe") Battery. This fire-safe, completely recyclable and incredibly long-cycle technology has become the core of their clean energy platform that has expanded into automobiles, buses, trucks, utility vehicles and energy storage facilities. BYD and all of their shareholders, including the great American Investor Warren Buffett, see these environmentally and economically forward products as the way of the future.